At 11:11 p.m. on Nov. 10, 2012, a two-story home on the south side of Indianapolis exploded with the force of as much as 5 tons of TNT. The blast – the product of an insurance fraud scheme – killed two people and injured dozens of others. Thirty-three homes were damaged so severely they were deemed unrecoverable, and had to be torn down to the foundation. Estimates for the total scope of the damage caused by the explosion exceeded $4.5 million. The explosion affected hundreds of lives – more than 500 calls to 911 were made within minutes, overloading the county dispatch– but none so dearly as the residents of Richmond Hill, their families and the first responders who lived through one of the most catastrophic events in Indiana history. Below, told in dozens of interviews and thousands of hours of courtroom testimony, find their stories in their own words. Shawn Looper raced down the street, trying to relay what limited information he had to emergency dispatchers. Moments earlier, Looper, a homicide detective with the Indianapolis Metropolitan Police Department, had been sitting in his home on the south side of Indianapolis when an enormous explosion sent debris and wall decorations flying through his house. Not knowing what had happened, Looper grabbed his department-issued firearm and radio and jumped into his police car. His neighbors thought a plane had crashed into their neighborhood. A 2,500-square-foot home at 8349 Fieldfare Way, right in the heart of the Richmond Hill subdivision on Indianapolis’ south side, had been leveled by an explosion. All that remained was the foundation and a massive field of debris. Looper was one of the first to arrive on the scene. By that point, the houses on either side of the Shirley home were collapsing in on themselves, and a fire – which, in the first moments after the blast had been just a small thing among pockets of debris – was threatening to grow out of control. Off-duty and wearing shorts and a t-shirt thanks to the unusually warm November weather, Looper was unable to approach any further than the front yard. “You could feel the hair on your legs just tingling from the heat itself. And the fire was too hot to go further,” Looper said. 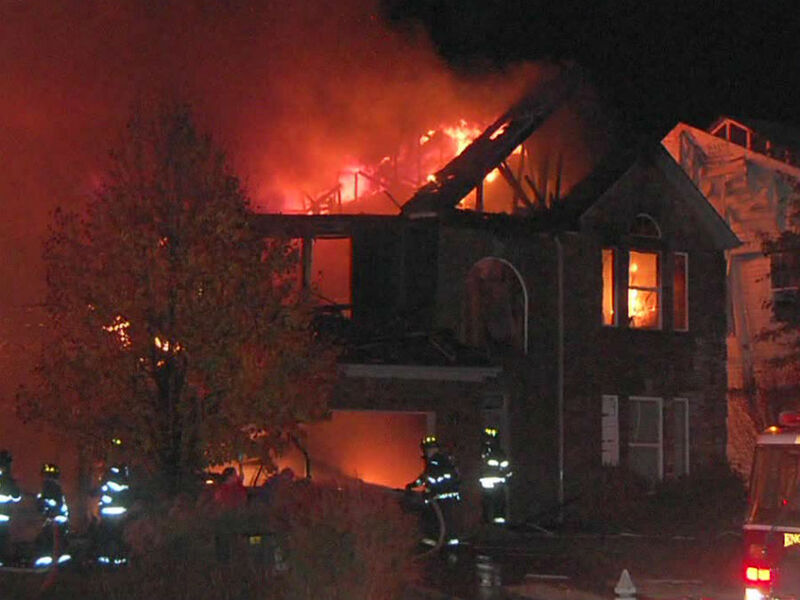 Firefighters attempt to battle flames at a home near the explosion in Richmond Hill on the night of Nov. 10, 2012. Cindy Glynn watched as her husband Bob went running down Alcona Drive toward the unknown cataclysm they’d awoken to. “My husband went running down the street and … oh god, this is horrible … all I could hear was people screaming for help,” Glynn would later testify. Glynn tried to comfort her son’s wide-eyed fear while she looked for the family dog. Bob returned saying they had to leave immediately – the neighborhood was going to blow up. Not yet realizing they were covered in blood, the Glynns loaded up their car and drove through streets filled with debris and falling insulation. Their dog, who had been lying at the foot of their bed, had been badly cut and required surgery. For months afterward, Glynn’s son slept on the floor of his parents’ room. Moments after the blast, Jeffrey Cross stood gripping a fire poker – the only means of self-defense at hand – as he watched a plume of smoke rise over his neighborhood. Around him, a shower of debris slowly floated to the ground, blanketing it in white. "It seemed like snow was coming down,” Cross said. “I assumed it was insulation coming down from the sky." From his vantage point in the southeast corner of Towhees Drive, Cross couldn’t see the smoldering remains of his neighbor’s house, which had exploded moments earlier. For a moment, Cross had thought the blast had come from inside his own house. Cross and his family had built their home in the Richmond Hill neighborhood nine years earlier. The necessary repairs were so extensive they had to move out. The family never moved back in – they sold the house while repairs were being made and left the neighborhood altogether. Kevin Cole woke just as the ceiling collapsed in on him. The house two doors north was gone. In between, the house belonging to Dion and Jennifer Longworth was falling into itself as it began to burn. Cole, hearing running water from broken pipes, realized his family had to get out. The force of the explosion coated nearby houses in insulation and caused severe structural damage to 33 homes. “I realized that if the water pipes were broken, the gas pipes might have been broken as well,” he said. As his family fled their home, the first Indianapolis Fire Department truck was arriving. "There was a gentleman on the back of one of the fire trucks I'll never forget,” Cole said. “He was unloading a hose and had this panicked look on his face. I never expected to see that." The Coles made it out safely and began moving toward the edge of the neighborhood. They turned around to see their life in flames. "We made it to the corner, and then we turned around and saw our house was beginning to burn,” Cole said. The Coles watched, unable to do anything else, as their home burned to the ground. It was all Dana Michelle Smith-Waddey could do to hold on to the screaming girl in her arms. Amojean Olvey, the oldest daughter of Glen and Gloria Olvey, was frantic, hysterical, screaming for someone to help her mother and father. Dazed and bloody, Olvey wandered around the outside of her home at 8343 Fieldfare Way – directly to the north of the explosion. Olvey, the injured female Looper had radioed about, was the only member of her family not trapped at that moment under a collapsing home quickly starting to burn. One of her neighbors, Kurt McDonald, had helped her escape through a blown-out window before returning to look for the rest of her family. Smith-Waddey lived at 8330 Fieldfare Way, just a few houses down from the blast. The explosion had turned her bathroom mirror into a missile – impaling it in the opposite wall. So much insulation had been shaken loose that the floor was barely visible. But the inside of her home was nothing compared to the scene she opened her door to. Despite her panic, other than a minor blow to the head, Amojean escaped her house with no serious physical injuries. The rest of her family wasn’t so lucky. As Kurt McDonald was helping Amojean Olvey escape her home, Ben Melvin was kicking in the front door. At first, he was met with nothing but debris. Then Gloria Olvey let out a single, blood-curdling scream. Gloria had been sitting in her recliner on the first floor when the house next door exploded. At first, she said she thought someone had hit her in the head with a baseball bat. Gloria yelled out to her husband Glen. Then she heard her youngest daughter, Katherine, crying. By that point, McDonald had returned, along with another man, Marc Hickson, and 17-year-old Michael Koerner, who had been driving just one street over when the explosion happened. While his family worked to escape, Michael Koerner made his way to Fieldfare Way, where Glen, Gloria and their youngest daughter Katherine were trapped in their homes. There, Marc Hickson and Kurt McDonald were working to free Gloria Olvey. They found her trapped under the collapsed ceiling, still sitting in her recliner. At first, they could only see her head. “There was drywall, insulation, wood hanging down with wires,” Hickson remembered. The men used a 2x4 to pry off the section of roof pinning her down, and then pulled her out of the chair. Glen was still trapped under a pile of debris. Although he couldn’t see his youngest daughter, Katherine, he knew she was nearby because he could hear her screaming. While other men helped dig Katherine out from where she was trapped, McDonald worked to remove the pile of 2x4s trapping Glen. Hickson, a firefighter/paramedic with the city of Lawrence, joined one of the responding firefighters in an attempt to reach the second floor of the home. At the time they thought the Olveys’ older daughter, Amojean, might have been up there. At that point, the second floor of the Olvey home was quickly filling with flames. The other firefighter, who had on protective equipment, stayed in the house searching for any other Olveys who might be trapped. He eventually learned they were all safe. With the Olveys safe, Hickson headed north to 8337 Fieldfare Way to help the Crosley family get out of their home. Michael Koerner returned to see if his own family had made it out. In addition to 33 stitches to her leg where a 2x4 went through her calf, Gloria Olvey required five more on her head. She and her husband Glen were numerous cuts and puncture wounds. Glen also suffered severe road rash from where the ceiling drywall had fallen and slid across his back. Katherine Olvey required stitches on her face, head and legs. She bears a permanent scar from one of the gashes to her head. On the south side of the neighborhood, Laura Littlepage and her husband were conducting their own rescue operation. Something like an earthquake had just shaken their whole house. Immediately they ran to check on her elderly mother-in-law, who lived in the room down the hall from them. Littlepage and her husband had to clear broken glass to reach her. After checking on their elderly neighbor, who had been thrown out of bed by the blast but who was otherwise fine, the Littlepages pushed their mother in her electric wheelchair to Mary Bryan Elementary, where Richmond Hill residents were being told to gather. Because the battery was dead, the Littlepages had to force the heavy electric wheelchair through a field to get to the school. Like many residents, they had been in bed at the time of the blast. They were still in their nightgowns when they arrived. Across the street and a few houses north from the explosion, the home at 8318 Fieldfare Way tilted back and forth, creating a grinding sound as its joints were wrenched against each other. After that, Jennifer Pitcher says, she remembers blackness and silence. Pitcher’s house would later have to be stripped completely down to the frame and rebuilt from the bones. Thinking maybe a small plane from a nearby airport had crashed in the neighborhood, Pitcher gathered up her 6-year-old and prepared to leave. “At first, my goal was to get out of the house. And then I thought, maybe I didn’t want to,” she said. In the chaos, she didn’t immediately remember that her sister lived down the street. “I looked down the street and saw all the fire vehicles, and then I realized that my sister lived down on that end,” she said. “I ran through rubble up to my knees that I climbed over. And I felt the heat from the fire. I saw my sister’s house and the shape it was in,” Pitcher said. Pitcher saw her sister’s neighbor, Tony Burnett, outside picking up rubble from his driveway. His house was almost directly across from where the explosion had occurred. On Andrusia Lane, one street over from the blast, Walter Colbert and Dean Weathers, just houses apart, were having similar flashbacks to their time in the service. At 8345 Andrusia Lane, Weathers thought a bomb had gone off. The only thing he could compare it to was a Mark 84 – a 2,000-poound bomb he’d trained with as an F-16 pilot in the U.S. Air Force. Up the street, at 8304 Andrusia Lane, Walter Colbert was shaken from his sleep. “For a moment I had a flashback to something I saw in Afghanistan,” Colbert said. A 27-year veteran of the Army National Guard, Colbert served in Afghanistan from 2010-2011. Years after the explosion, Colbert would tell a jury the only thing he’d experienced close to the blast at Richmond Hill that night was an IED outside his post in the Middle East. Colbert was brought to his senses when his son yelled that there was a cloud over the neighborhood, coming down from Fieldfare Way. “I was eerily quiet, and this big hole down where some houses used to be,” Colbert said. 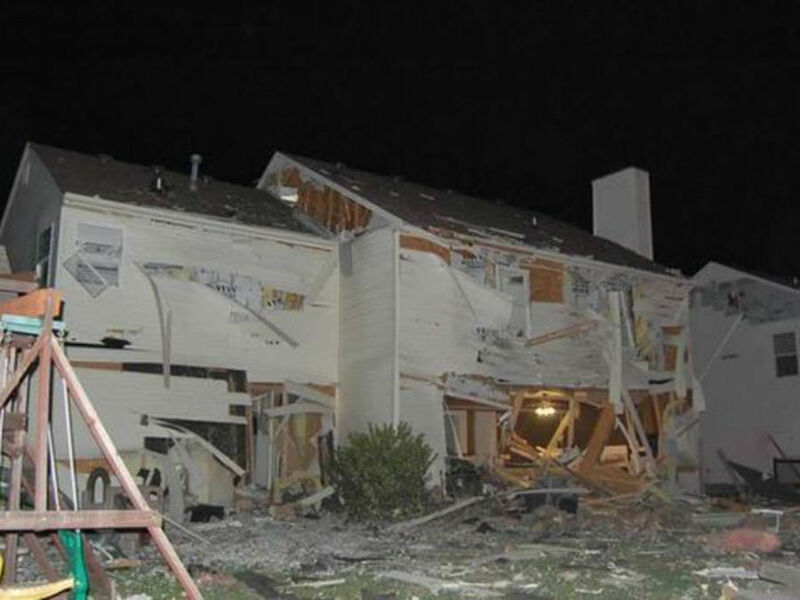 He didn’t yet know it, but the blast had caused stress fractures in almost every wall of his house – “every corner, every seam” he would later testify. Back down the street, Weathers – whose house also suffered more than $100,000-worth of damage – had a more immediate concern as well: he smelled gas. Thinking the plume was probably being fueled by a natural gas leak, Weathers began to worry the rest of the neighborhood might blow. At 8305 Flicker Court, in the northwest corner of the neighborhood, Barbara Wilson thought it was the apocalypse. Wilson looked outside and saw firetrucks rushing into the neighborhood. It looked like it was raining insulation. Then she heard her daughter screaming for her. She’d received a call that her mother’s neighborhood had just blown up. One of the furthest houses in the neighborhood from the blast, Wilson’s home nevertheless sustained massive damage. “There was a crack around the whole house,” she would later testify. “The entire side of my house was not attached. Walls had to be replaced. Every window had to be replaced. The doors had to be replaced. The siding had to be replaced. Bricks had to be replaced. I had to pack up and move out for months while they rebuilt my house." Dion and Jennifer Longworth’s house at 8355 Fieldfare Way, 10 feet south of the explosion, had collapsed in on itself. All around, fire was quickly spreading to a field of debris made up of the house next door. In the basement, Stephen Pridemore could see an arm moving around. The retired police officer was at home on Alcona Drive with his wife Peggy when the blast happened. Their first concern was getting out of their own home safely. Meanwhile, the Pridemores’ neighbors, Bryan and Heather Hollingsworth, were trying to come to terms with the damage to their home. 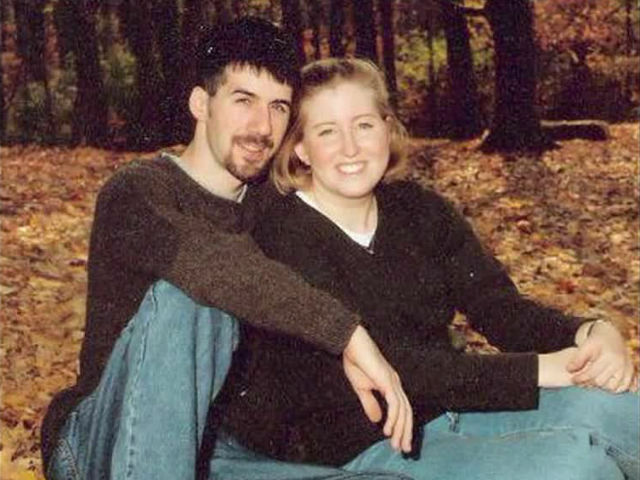 Dion and Jennifer Longworth in an undated file photo. “As I went downstairs, all I could see was what appeared to be dust, but what was actually glass, because all of the cabinets in our kitchen had opened and expelled their contents,” Bryan said. His wife, Heather – covered in glass – yelled at him that he had to see something. She pushed the wall of their house. It moved enough that they could see outside. The Pridemores and the Hollingsworths exited their homes to the same sight: A growing fire, and something terribly wrong at the house behind them on Fieldfare Way. “It was a two-story home that was no more,” Bryan Hollingsworth said. “It was now a one-story home in terrible disarray with a debris field that was just thick. There was insulation, wood, siding and bricks everywhere. As we looked at the Longworth residence, the house was about 7 feet tall at this point. "My wife called out to see if anyone was in there, and we immediately heard a knocking and someone say, 'I'm in here, I'm trapped.' We tried to find him, but there was too much debris. It's hard to describe. We saw a hole about the size of the basketball. All of a sudden we saw Dion come up to that hole. He asked us, 'How is my wife?’ And, ‘Are you going to be able to help me?' We tried to tear away the drywall with our hands, but we couldn't do it. It was like concrete. "He was calm. He was very calm. I could hear him rummaging around in that basement trying to get out, but the debris field was so significant… the term Heather and I used was a house pancaked on itself. Lt. Dean Teagarden was assigned to Station 63 on the night of the explosion. The station is so close to the Richmond Hill neighborhood that the force of the blast pushed Teagarden off the wall he was leaning on. Even so, by the time the Station 63 ladder crew got to the scene, the Longworth home was already 70-80 percent engulfed in flames. Teagarden and his crewmates found Dion Longworth trapped in a void space in the basement of his home. He’d been on the first floor when the explosion happened. As the house collapsed around him, he’d fallen into a hole in the basement where the chimney used to be. Teagarden tried to remove his mask to allow him further access to the hole, but was unable to because of the intense heat. One of his crewmates, Private Richard Shirven, was able to get a little closer. "I'm moving any kind of wood or debris that I can. I could reach in. I grasped his hand and tried to pull him out. He was very mobile. He wasn't hurt very bad. He had blood all down his face and arms. I assumed he had a laceration on his head. I was prying what I could. I was pulling out what I could. But, like I said, there were two floors of wood on top of him." After seven to eight minutes of frantic efforts to save Dion, Teagarden had to make the call. He pulled his men out before the fire consumed them too. By the time John Longworth arrived at Mary Bryan Elementary, there were maybe 100-200 people milling about – many in their pajamas and slippers. But none of them were his son Dion or daughter-in-law Jennifer. "I'd gone to bed early that evening with a cold,” Longworth remembers. “My grandson called sometime after 11 p.m. asking if I'd felt an earthquake. I said no. I tried to go back to sleep. A short time later he called back and said there'd been reports of an explosion on Fieldfare Way." Longworth headed toward Richmond Hill, but was redirected to Mary Bryan by police who had the neighborhood cordoned off. "I go in and they had maybe 200-300 people in there,” Longworth said. “I asked police what was going on. They had a list of people, but Dion and Jennifer weren't on it. A chaplain told me they may have been taken to a hospital. They gave me a list of four possible hospitals. I called my wife and asked her to call two, while I drove to the other two." Eventually, after finding no record of their children at all four hospitals, Longworth and his wife headed back to the school. By that time, Monserrate Shirley and her boyfriend, Mark Leonard, had returned from the Hollywood Casino in Lawrenceburg, where they’d spent the day, and had arrived at the school as well. Amid the chaos, few of their neighbors even noticed the presence of the people who actually lived in the home that had exploded. Longworth found a police chaplain, who told him 8355 Fieldfare Way was “ground zero” for the explosion. "They told me they would be getting a coroner… that once they got the fire under control, they would be searching for bodies,” Longworth said. “That's when I called Jennifer's parents and Dion's mother and told them they probably needed to head to the school." There were still no updates when Jennifer’s parents, Don and Nancy Buxton, arrived at the school. "We went to the gym and we sat down, and we pretty much waited all night to hear the news,” Nancy said. Hours later, when the fires were finally under control, the same firefighters who tried to save Dion Longworth were tasked with finding his body. An autopsy determined Dion Longworth had extensive burns covering more than 90 percent of his body. Pathologists found soot covering his entire respiratory tract, all the way into his lungs. His cause of death was determined to be inhalation of soot and hot gases, followed by severe burns. Jennifer Longworth was on the second floor of the home when the blast happened. The city’s chief forensic pathologist would later testify that she believed Jennifer died nearly instantly from the pressure wave caused by the explosion. Although John Longworth and others searched for Dion and Jennifer’s dog Pepper, the animal was never found. Despite the massive damage the explosion had caused, Dion and Jennifer Longworth were the only casualties. In the morning, when the fires were out and the smoke had cleared, the task would be to figure out what, or who, had caused their deaths. This story is Chapter I of a three-part series. Click here to read Chapter II: The $4 Million Arson Plot. Jordan Fischer is the senior digital reporter for RTV6. Follow his reporting on Twitter at @Jordan_RTV6 or on Facebook .